Hullaballoon’s owner offers a zealous call to buy local this Christmas. A Hull city centre trader is encouraging people to support local businesses in the run up to Christmas. Hullaballoon owner Mark Carter, who has run his party decorations shops for 11 years, disclosed the secret to his independent business’ success. 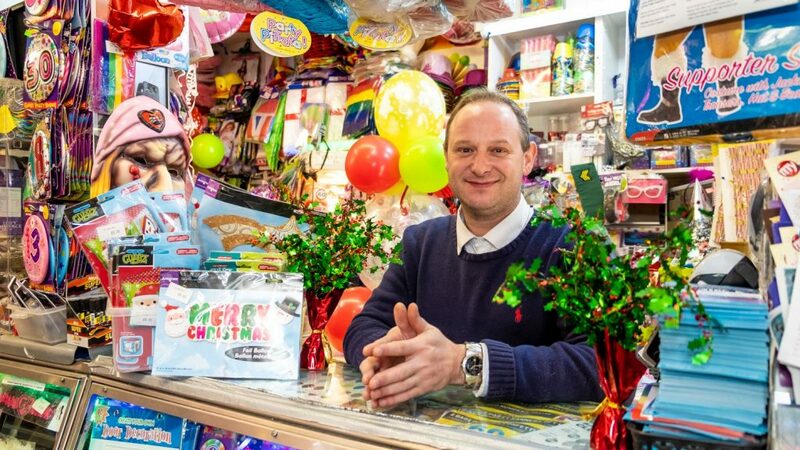 In his Aladdin’s cave stocked from floor to ceiling with seasonal and year-round party products, Mark explained that a local feel, with local people at the helm, makes Hullaballoon a business that people trust, and continually return to. Mark’s city-centre shop is on Percy Street, a relatively quiet zone one would think, just off the main thoroughfares. It’s interesting to note, however, that several of the businesses on the street and around the corner have been trading there for many years. The demise of the High Street, as shoppers surf online for bargains, is not affecting all small businesses, it seems. Establishing a local understanding and family feel is very important to Mark’s business: “I really want customers to keep coming back to us! I aim to make customers happy, to give them good value, to give them great service.” Mark is certainly a very engaging character, often seen chatting to passers-by outside his shop, a street evangelist for his business even. “They do say, word of mouth, is the best way to bring in more business, because if someone has a nice experience, they’ll tell their friend,” says Mark. It’s worth a visit to either of Hullaballoon’s shops just to have a look at the wide range of sometimes quirky items on sale, there’s a particularly interesting range of Christmas balloons for example, in all sorts of shapes, sizes, and foils. Mark and his staff will also tell you excitedly about their stock’s quality, how the balloons are filled with special gases to keep them pert for longer than expected, apparently they won’t leave the customer feeling deflated after only a day, they’re filled to last. It’s local, specialist businesses like Hullaballoon that will be keeping the city-centre’s side-streets trading for years to come. 1 Comment on "Hullaballoon’s owner offers a zealous call to buy local this Christmas."